Surprisingly few action games have the punch of the recently-released film. Kat examines why. Last night I sat down to watch one of the most entertaining action movies that I've seen in quite a long time — Mad Max: Fury Road, which was released last week and has since been recommended by basically everyone (it's currently enjoying a 98 percent rating over at Rotten Tomatoes). Plenty has been said about George Miller's marvelous action film on other sites; but as I watched Max and Furiosa's desert escape unfold, my mind turned toward action games. Specifically, there has been only one action game recently that has excited me as much as Mad Max: Fury Road. This from a genre that is supposed to benefit from being more interactive, and thus more engaging and kinetic. That one action game, in case you are wondering, is Bayonetta 2, which at times comes close to matching Fury Road's sheer energy. The battle atop a fighter jet that highlights the first level is a showstopper on its own. But Platinum is also in a class of its own when it comes to action games. The truth is that a lot of action games today are handsomely designed, incredibly polished, and surprisingly rote. First-person shooters like Battlefield Hardline come immediately to mind (games that feature campaigns cut from much the same cloth as the traditional action game), but I was also surprised by how bored I ended up being by Middle-earth: Shadow of Mordor, which starts out promisingly but devolves as Talion becomes next to godlike. Precious few have kept me glued to the screen in quite the same way as Mad Max: Fury Road. The reasons are worth examining. In writing about Fury Road, one blogger made a salient point about its pacing: "The film begins by jumping straight to the final act. This is the boxing movie where the first scene is round one of the climactic final fight. This is a Star Wars that opens with the assault on the Death Star. Mad Max respects the viewer’s time by starting the story as close to the end as possible. The film excises as much as it possibly could, leaving nothing but the lean bare essentials of the story it wants to tell." 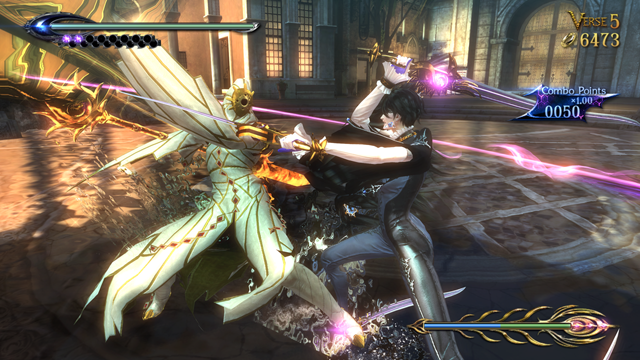 Bayonetta 2 is still great. In the tradition of directors like Alfonso Cuaron, Fury Road does its best to leverage the fact that films are a visual medium. It allows viewers to infer what is happening with its visual design, body language, and visual cues. There is almost no expository dialogue outside of a few lines about Furiosa's history. You'd expect video games to take a similar approach given the interactive nature of the medium, but the genre is still heavily reliant on lengthy, non-interactive cutscenes. The Call of Duty series in particular styles itself as a blockbuster film as much as a game. That approach is echoed to varying extents in shooters and action games pretty much across the board, from The Last of Us to God of War. A notable exception is Bioshock, which puts players in the shoes of the protagonist pretty much from the outset and leaves them there. It's tough to forget the moment you hit the water, swim toward a mysterious tower in the distance, and find a statue holding a banner inscribed with the legend, "No Gods or Kings. Only Man," which tells you almost everything you need to know about Rapture. Ken Levine's foibles as a designer merit their own separate, but he's always had a knack for using the visual medium of gaming to convey his ideas. In the meantime, while Fury Road does everything in its power to minimize exposition, it maximizes its action scenes. Before we headed into the film, my partner gleefully called it "Chekov's everything" in reference to the old storytelling standby. Almost nothing is wasted in Fury Road, with everything from Max's V8 Interceptor to the guitar-playing herald fronting Immortan Joe's war party. As such, Fury Road's action scenes are both tightly designed and visually interesting, ensuring that your attention never wanders even as explosions dominate the majority of the film's two-hour runtime. What's more, Fury Road makes phenomenal use of the fact that the majority of the action takes place in moving vehicles. Over the course of the film, both good guys and bad guys crawl in and out of windows, clamber over rooftops, and hang from side doors. You never know where a War Boy is going to pop up next. 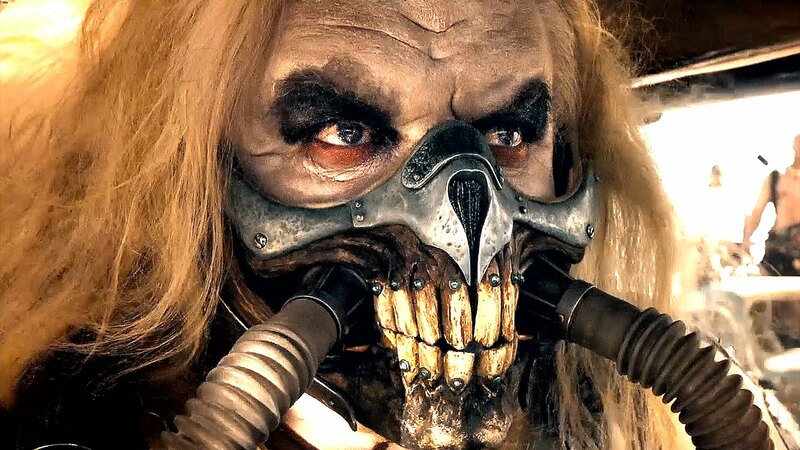 Immortan Joe is almost more important to Mad Max: Fury Road than the hero, from which the film derives its name. He is there from the beginning, eyes glaring out from behind a nightmarish skullfaced mask decorated with horse teeth, an aging warlord commanding a fanatically devoted cult. If Fury Road is in large part about women's liberation, then he is the perfect foil, screaming at one point toward one of his pregnant wives, "That's my child! My property!" Immortan Joe's outsized impact on Fury Road makes me think of how rare it is that we get a really great villain in action games these days. Metal Gear Solid: Revengeance has an evil senator. DMC has Vergil, though he's mostly an ally throughout the course of the story. Arkham Aslyum has Batman's rogues gallery, but its boss fights are famously its weakest part. Bioshock, of course, has the taunting voice of Andrew Ryan and his haunting command, "Would you kindly?" For as polished as action games are these days, it's tough to find a villain as memorable as Immortan Joe. And while a great game doesn't necessarily need a great villain to be successful, it rarely hurts. Action games continue to be the bread-and-butter of the medium. Like summer action films, they continue to be the most reliable means by which to bring in a mainstream audience. Generally speaking, they are extremely polished and highly rated by reviewers. Some might argue that we're even in a kind of action game renaissance right now. But there's also plenty about the genre that bugs me. While From Software and Platinum continue to push the envelope with their respective games, franchises like Assassin's Creed, Call of Duty, and Arkham have long since settled into rote design, preferring to avoid taking outsized risks that might hurt sales. With the bottom having fallen out of the middle-tier market over the past few years, the risk takers have all but vanished, Wolfenstein being a happy exception. The genre had a great run between 2005 and 2011; but since then, refinement has been the rule. Watching Mad Max: Fury Road made me realize how rare it is these days that an action game or a shooter really makes my jaw drop. I can't think of anything off the top of my head that has quite the same mix of tight action setpieces, phenomenal art design, and memorable villains. It is in many ways a reflection of what the action game genre can be at its best. Action games don't all need to be extended car chases, obviously, but I wouldn't mind seeing more like it. Tagged with Analyses,	mad max fury road,	USgamer. Avalanche is right at home.